To feel whole. To be connected to our feminine and masculine, our shadow and light, our power and powerlessness, our strength and our weakness. To embrace and accept all these aspects of our Self. We are each complex beings. We each have unique histories of both lived experience and that of our ancestors. And while we are each unique, there are many, many common threads that tie us together. Part of our healing is learning to come together. To share our stories. To show our shadows. To have our powerlessness and weakness witnessed. To be celebrated, seen, and heard as the truly amazing and complex person we each are. We all have a shadow. We all are driven by unconscious forces. We all cause unintentional harm to others. As we bring our shadows into the light, as we bring our unconscious stories into our consciousness, healing begins. Self-awareness is the necessary first step of our healing process. Self awareness is bringing our unconscious into consciousness, our Shadow into the Light. Becoming self aware can look like many things. For me, and my work, it begins with connecting to our breath, to our body, to our physical sensations. It begins with coming into our body and learning to listen to her. As we do this work we become more and more aware of the stories that live within us, where they came from, and how we act out from them. As we become aware, and only once we are aware, we can start to change the patterns and behaviors that are not representative of our true deeper Self. Once we are aware, we can begin to shift and sift and make repairs where necessary. As we become aware, we can do and be different in the world, in our own being. Healing into wholeness is a process. It does not happen in a week, or a month, or even in a year. It begins slowly at first, in fits and starts. After a little while you start to notice subtle shifts and changes. You start to notice that you are speaking out more, or you start doing something creative that you love again, or you express yourself more in the way you dress, or you simply feel a little lighter, that you that breathe a little easier, that you are standing a little taller. With more time and more work, a snowball effect starts to happen. More and more you find yourself speaking up and out. More and more you notice how you are expressing who you are in subtle and obvious ways. More and more you realize you have fewer and fewer fucks to give. More and more you begin to feel comfortable and at home in your own skin. 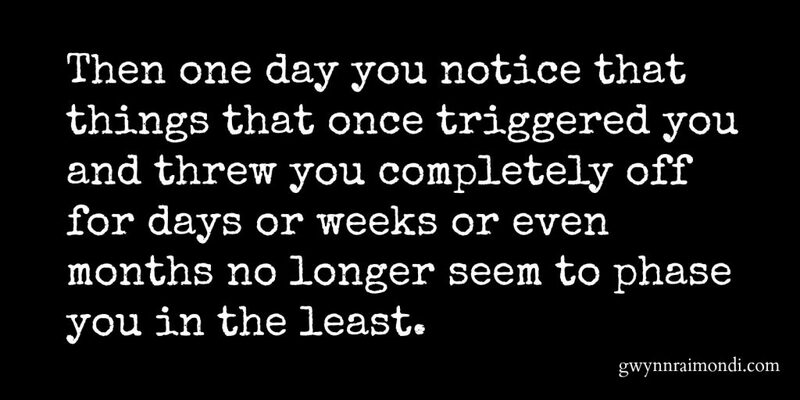 Then one day you notice that things that once triggered you and threw you completely off for days or weeks or even months no longer seem to phase you in the least. These are not signs that our work is done. We have millennium worth of training, shaming, and disconnecting to unravel and heal. They are however signs that we have been doing the work, and that we are in a place to pass on healing to others in ways that feel good and right. And as we are in the place to guide others to their own healing, and look at the ways we have caused harm and make repairs, we each continue to do our own deeper work. And so this work grows and grows. So healing grows and grows. So our world shifts and sifts and morphs. This is how we dismantle the systems that oppress. This is how we create true equality. Do our own inner work, and make the shifts in our outer work that need to occur. Make amends where necessary and possible. Find ways to help others in their own healing. Repeat until our last breath. I talk more about healing into wholeness in this video below. It’s just over 20 minutes long, so go ahead and make yourself a cup of tea or pour a glass of wine and settle in.